Starring: Colin Farrell, Barry Keoghan, Nicole Kidman, Raffey Cassidy, Sunny Suljic, and more. For those that have been following my reviews, you all know I am a major fan of A24 studios. The studio has been a powerhouse for independent and unique films for a number of years. Most recently, they have released critically-acclaimed films that have garnered many awards including an Oscar Best Picture. Regardless of all of that, here we have another review on an A24 film that I have had my eye on for a bit. This film is ‘The Killing of a Sacred Deer’. Now, this film may be one of the more unknown films out of my reviewed A24 films. If I could provide any spoiler-free insight to what to expect beyond what you may see for yourself with the trailer above, this film is a tad bit… strange, and I say that in a higher sense than any other A24 film I have previously reviewed. So without further delay, my review of ‘The Killing of a Sacred Deer’. I already hinted to it and actually seeing the film backed it up ten-fold: This film was a strangggeeee one. That absolutely does not take anything away from how much I admired and was awe-shocked by the film but boiled down, it was strange, unique, creative, and a slow-burning trip of a psychological thriller. 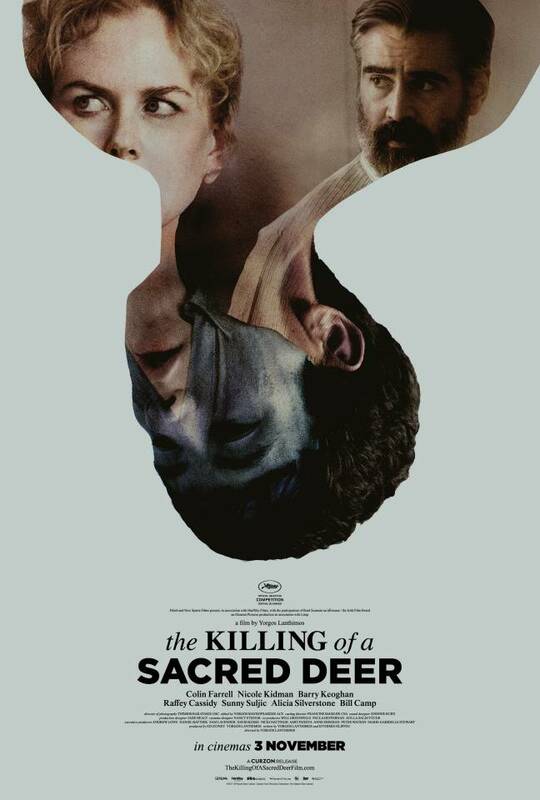 As A24 has done so well in recent past, ‘The Killing of a Sacred Deer’ is an incredibly made film that tears into the viewer’s mind challenging those who welcome it. Yorgos Lanthimos, the director and co-writer for the film, has created quite a reputation for himself, especially within the dark comedy genre. This film is no exception to that statement with plenty of moments happening where we catch actors exchanging with each other, saying very crude or questionable things but in a very light manner. I found even myself giggling to myself but then thinking, “wait, why did they say that?”. ‘The Killing of a Sacred Deer’, once again, is an experience all in its own. Yorgos delivers in prime Yorgos fashion a psychological thriller drizzled with dark humor and absolutely unsettling moments. Another point I would like to touch on was the acting. From phenomenal to forgetful. Beginning with the negative; Raffey Cassidy’s performance of Kim Murphy. The character fell flat (flatter than her tone) for me throughout the film. A character who was seemingly unemotional, boring, and disinterested. Whether this was the intention or whether she was a mere similar image to Colin Farrell’s Dr. Steven Murphy who also was seemingly dull but still more lively than his daughter, or whether this was simply the product that was delivered where that would fall moreso on Raffey’s shoulders. Nonetheless, I was not a fan of Kim Murphy. I could see a more teasing and sadistic portrayal of a sister as a better fit than the dull version. But, to each their own. I would like to hear other opinions on this. On the opposite side of the spectrum, we have Barry Keoghan. His performance was creepy and chilling. He hit the nail on the head in regards of being the perfect fit for a troubled kid with a side of insanity. His performance was quite chilling at times and yet on the flip side, he was hilarious. He proved the perfect fit for Lanthimos’ dark comedy. Him alone makes me want to watch the film again. Ultimately, ‘The Killing of a Sacred Deer’ retains A24’s status of being a film that seems to be an acquired taste. Very unusual and even very unsettling at times for some viewers but to others it may be too slow or simply disinteresting. Regardless, I am yet again a fan of another A24 film. While not being my favorite or high ranking on the overall A24 scale, it has aspects I hold in high regards like Barry’s performance and the discomforting feel of the dark comedy. Ultimately, ‘The Killing of a Sacred Deer’ was worth the excitement I had leading up to my viewing. For the fans interested in slow-burning and unique films, this is yet another A24 film for you. Posted in 2017 Movies, Movie Review.Tagged A24, Movie Blogger, Movie Reviews, The Killing of a Sacred Deer.